Yep, we did it tonight – a latte art throwdown. Five great baristas, 3 keen judges, 1 timekeeper, a $50 pot and a full house of spectators all waiting to see which barista would produce the best looking latte art of the evening. First place winner, Braden Walter and second place went to Antonio Nesbeth. Congrats guys! Many thanks to Eric and Kevin – judges, Matt from La Prima Espresso, awesome barista and an even awesomer guy, the really rad competitors, Megan – timekeeper and runner, Emily – awesome throwdown organizer, all you spectators for cheering on our competitors, eating all our pizza and drinking all the beer and the couple from Seattle for taking all the pictures (great to have you visit Tazza D’Oro). What a great night. I love this coffee business stuff. Thanks, Emily and Amy, for the invitation to judge - it was a great time for all. Cool and varied latte art, stellar coffee as always, great pizza and beer - what's not to like? Damn nice work Braden, Emily thanks for organizing. 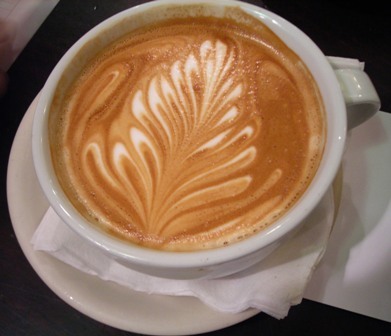 next month's challenge - triple rosetta macchiatos!